Oh there’s a hint a winta around my follicles. Back in the UK as the season of mists and mellow fruitfulness pisses me right off. While I wait for wealth and fame, the northern winter isn’t waiting for me. It’s here and drawing me in. The shawl of evening darkness folds around me. If you’re a true fish-chip-mushy-pea gobbling Brit there’s only one thing to do. Yes – head for Blackpool. Gaw Blimey Guv – Is that the Chattanooga choo choo? Most of my readers are not in the UK. Very often I am in the warm air, vines and swallows of France. 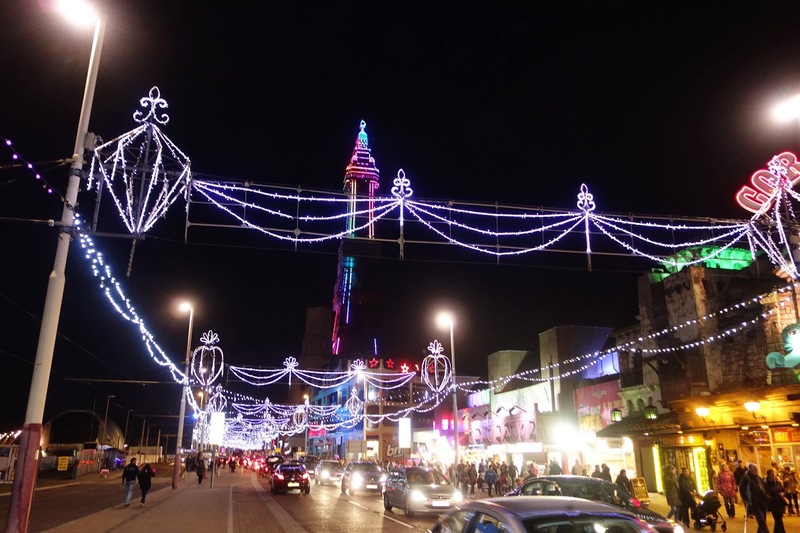 It is just possible that some citizens of the world know little about Blackpool. It is a strange blend of features but if you can imagine Liberace’s fast food joint set in the middle of Buffalo Bill’s carousel you kinda get the idea. Add to that a massive sandy beach, a tower dans le style d’Eiffel and some wonderful trams and you have our British jewel of the Northern Night. 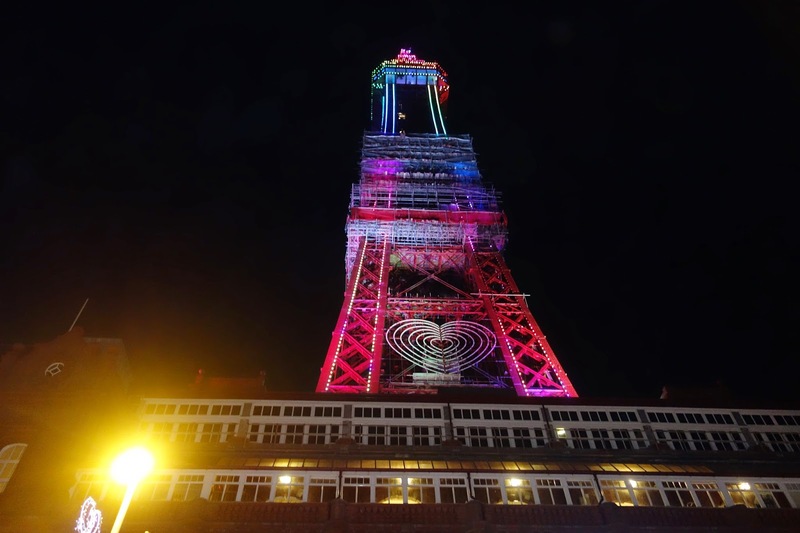 On 29th August, top Brit’ comedian Peter Kay threw the switch to turn on the illuminations. Winter be gone! 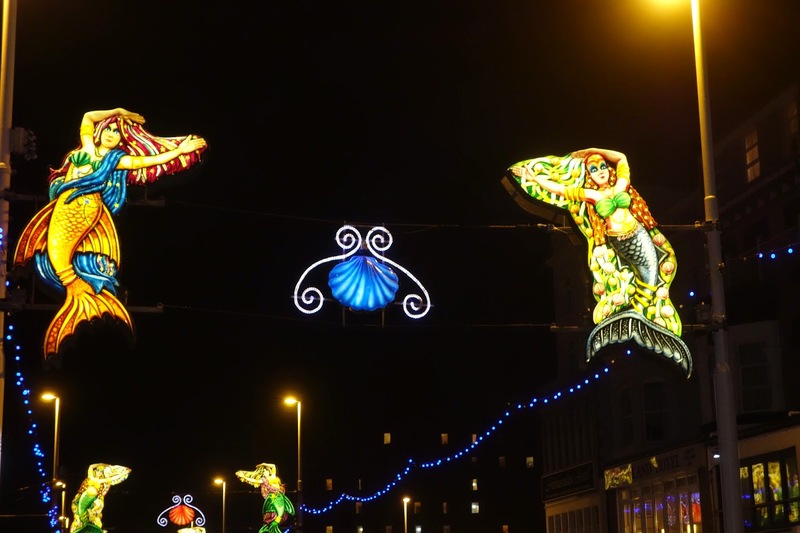 The illuminations are on. It’s all completely over the top, brash and ridiculous. I fitted in at once even though no one understood my London/French accent. Of course there was only one possible type of dinner. 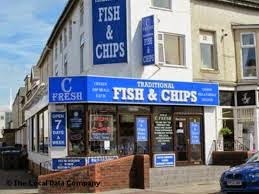 We headed into C’Fresh fish and chips restaurant which is in Lytham Road, just off the Promenade strip. I dined on battered haddock, chips and mushy peas. We drew astonished stares by sharing a bottle of Blossom Hill Merlot but I was a glamorous Romantic novelist out on the town with my hunk. Pints of beer and mugs of tea seemed more popular. The wine was moderately priced by restaurant standards. The fish was fine white and fresh. The batter and the chips were cooked to order. A charming young lady took our order and politely answered my stupid questions about sales ratios between cod and haddock. So, for excellence in the realm of British traditional cuisine my first UK spare tire tummy award goes to C’Fresh of Blackpool. 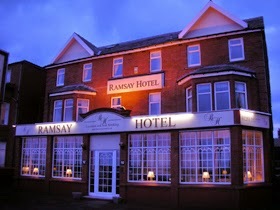 We stayed at the Ramsay hotel on Queen’s Promenade. The prices were modest indeed. The room was comfortable and lavishly stocked with tea, coffee, hot chocolate and bottled drinking water. Soaps, shampoos and gels were plentiful. All of these products were top quality branded stuff – no cash and carry junk. We had breakfast of a good choice of cereals and fruit juice as a starter. The full English breakfast was lavish and well cooked. There was also toast. All the spreads and the butter were top quality products. I do not hesitate to give an Emma’s spare tire tummy award for English seaside excellence to the Ramsay hotel. The proprietor was a lovely chap called Uttar Tamata who was most welcoming. Does my fin look big in this? And finally, back to Blackpool.Half of the 360 degree vista is the sea. It’s a real bucket and spade beach complete with gulls. All the jingle jangle of cash and the flashing of lights mean nothing to the long term course of Nature. On the sands a child will form a memory of a parent helping to dig a magic castle and will carry it to death as the lights switch off. Such is our season and such is the joy of the resort town. Immortality is not the repetition of mortalities but it will do while there is still power in the switch and a contempt for the darkness. 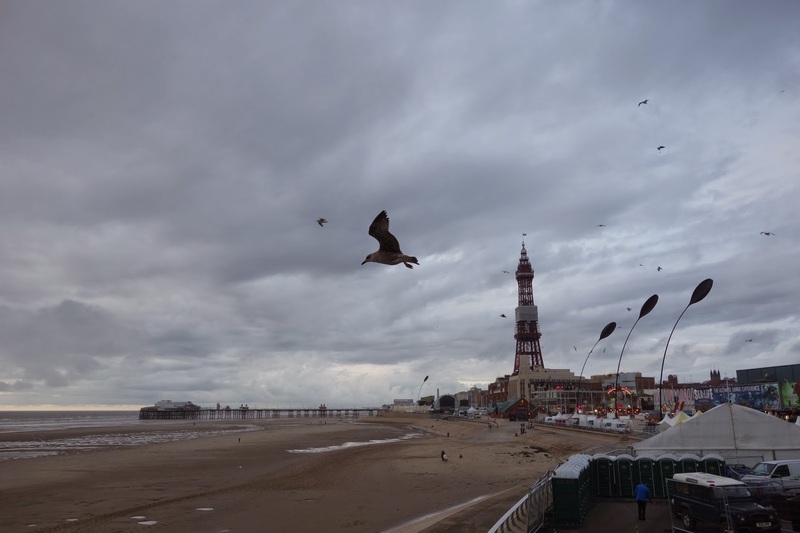 Blackpool, your brash slash of trash panache,your hour defying tower of power, – je t’aime. Emma Thinx: Lighten your soul. Bleach your dark roots. 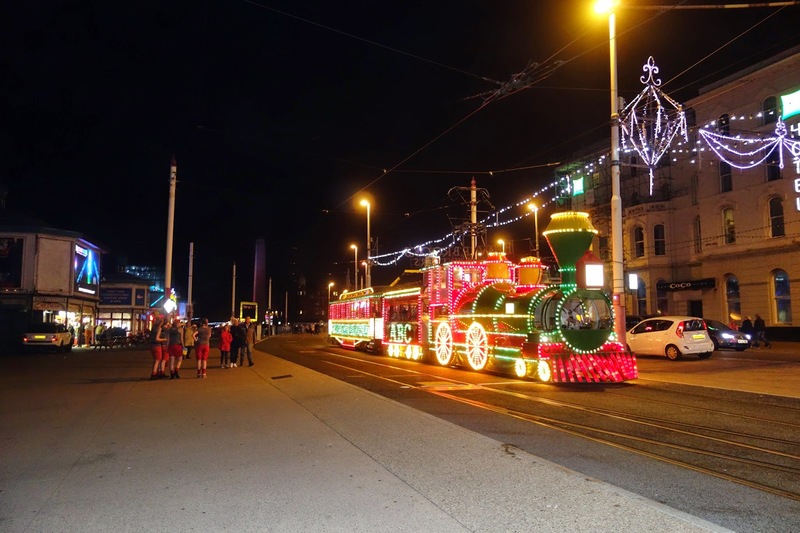 This entry was posted in Blackpool, Blackpool illuminations, Blackpool tower, Blackpool tram, C Fresh, Fish and Chips, Golden mile, Peter Kay, Ramsay hotel by emmacalin. Bookmark the permalink.